Let's see some pics and specs! Discussion in 'E39 (1997-2003)' started by GregS_WI, Mar 4, 2008. Upgraded M5 thrust arm bushings, replaced entire cooling system, windshield and "cover", clear corner headlight covers, Hella Celis red/clear tails FTW, clear sidemarkers, Silverline DICE, hardwired BEL RX65, MKII 4:3 Nav to MKIII 16:9 Nav, CCFL AE's, M5 kidney grill, new BMW badges, "race" mesh project, potenza RE760's and more to come...LMAO! Here is my 2000 528i. 100% stock, call me crazy I lover her just the way she is. 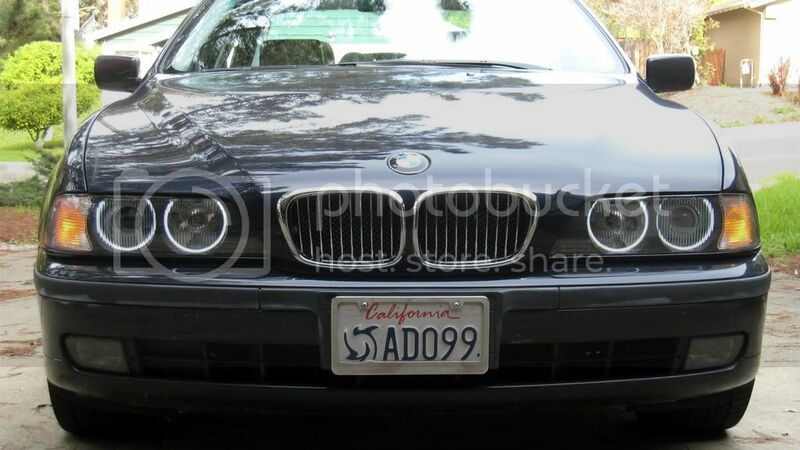 I am however, going to give her some angel eyes as soon as they get to my house. I ordered them a few days ago, and can't wait! I love the way they look. You all have inspired me, thanx. That red 528i Sport is drop dead gorgeous. You are the nicest people I never met. You guys always make me feel welcome to this club. Very nice thing to say...remember to mount the AE's on the outside of the glass lenses and not behind them (see previous pic) cause the ribbing on the glass distorts the AE's. That is what we are all here for. Welcome to the CCA. We help each other out installing parts, looking at other bimmers (Thanks to AZ)! Not exactly the most artsy pics, I know. I just brought her home this week. 328i wagon. Soon to get all weather floor mats. Got a new camera and took some new pics. Thought I'd share! New video also on my cardomain in the sig! Yet, shalt be extolled by light's demise. Thought I'd post in response to the invitation, even though one of the cars pictured isn't a BMW. The 528i is a 5-speed sport package and is approaching its 10th anniversary, currently at 193,000 miles on the odometer and showing no signs of fatigue! The 325i is also a sport package 6-speed 2006 model that our son drives. My wife's grocery getter is the Audi TT Turbo Quattro - also a 6 speed. That is some very impressive stable you have pards! As the recent proud owner of a true M-Sport....a 2003....seeing you with one PLUS an M-5 is just incredible to me. Am sure you can speak with authority to the differences between these 2 fine machines. Man, your insurance bill has to be HUGE! Have you ever considered the Dinan short throw option? Without the experience I'm curious over what that would feel like. What tires do you run on your M-Sport? Regretably, I have Dunlop 235s front 265 rears and am looking for an ideal setup when these go. I don't like Dunlop as I've always used Michelins on my previous 5s but this M-Sport is a whole different world from all of my previous 5ers since they were all 528 and 530s. Sport packages but not a true M-Sport like this girl. So I could use some insight....Not a track guy ...just a highway enthusiast who likes to maintain the handling characteristics of the car but still a quiet and smooth ride as Michelin always seems to provide. I'm likely to add the Dinan air induction option too. Extra horsepower wouldn't hurt. Any idea on how much you pick up with the addtion? Thanks for any input you can offer. You're one lucky dude....a fine stable there! Mid Ohio Vinatage Races ? Finally got a better photo of my 2000 528iA Sport. Since the last shot I've rebuilt the Vanos and replaced the entire cooling system. Is the Buckey Chapter planning a coral for the Vintage Races at Mid Ohio June 26-28th? Featured marque is the Mini Cooper. Should be a fair number of Bimmers in attendance I'd think? 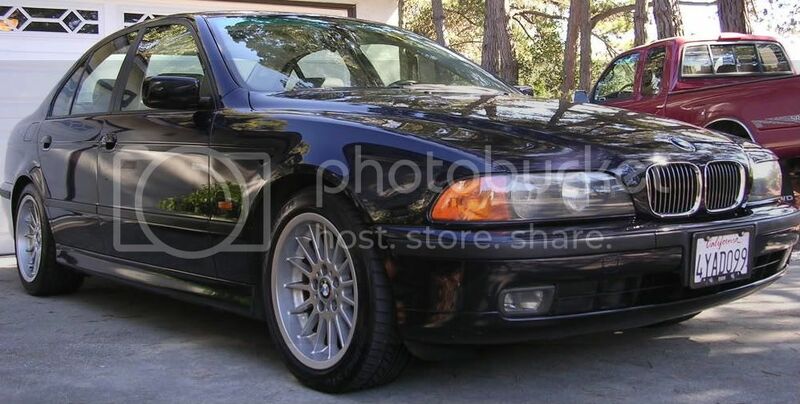 Looking for a coral that would take me and my 2003 M-Sport. Don't you just love sport seats . Am I the only one who keeps the thigh support bolster all the way extended? 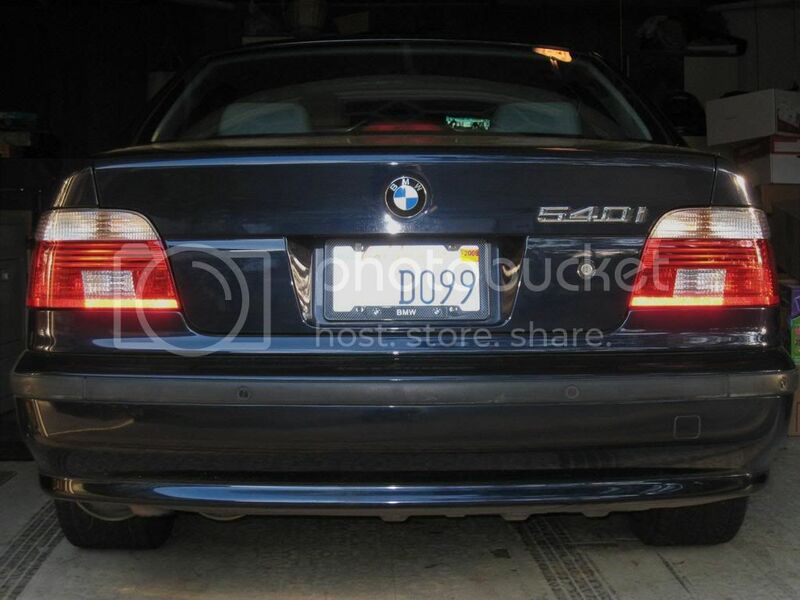 Where did you get the Super white halo bulbs? I was thinking of getting blue ones.